The Leonid meteor shower peaked last night in the UK - November’s meteor shower happens every year around November 17 or 18. The shower is called Leonids because its radiant, or the point in the sky where the meteors seem to emerge from, lies in the constellation Leo. The Leonid meteor shower has been responsible for some of the most intense meteor storms in history, with rates as high as 50,000 per hour. However a typical meteor shower produce rates of about 10 to 15 meteors per hour at the peak, in the darkness before dawn - your best bet is to watch the shower between moonset and dawn. The best time to see the shower is usually after the moon has set and during the predawn hours. The Leonids occur when the Earth passes through the debris left by Comet Tempel-Tuttle. The comet takes around 33 years to make one orbit around the Sun. Royal Museums Greenwich said: “The Leonids are usually one of the more prolific annual meteor showers, with fast, bright meteors associated with Comet Tempel-Tuttle. “The radiant (the point where the meteors seem to stream from) is at the head or ‘sickle’ of the constellation Leo the Lion, hence the name. “As the comet follows its path around the sun, it leaves a path of tiny debris. According to NASA: “Leonids are also known for their fireballs and earthgrazer meteors. Fireballs are larger explosions of light and color that can persist longer than an average meteor streak. “This is due to the fact that fireballs originate from larger particles of cometary material. Fireballs are also brighter, with magnitudes brighter than -3. “Earthgrazers are meteors that streak close to the horizon and are known for their long and colorful tails." The Leonids meteor shower peaked overnight between Saturday, November 17 and Sunday November, 18, however the shower continues until November 20. The shower can still be viewed for several days either side of the peak weekend, although the moon will continue to obstruct viewers. 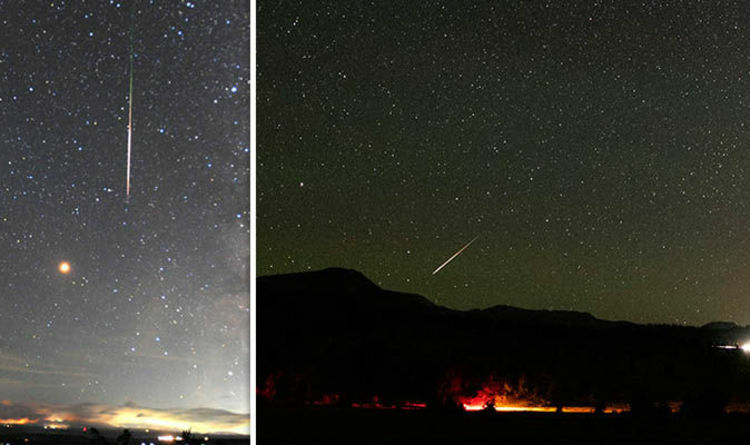 According to the American Meteor Society, skywatchers can expect to see around 15 meteors per hour this year. NASA said: “The Leonids are best seen after midnight your local time, once the Moon has set.